Now a married couple, Kaitlin and Panos put a lot of thought into where they would begin their new lives together and ultimately decided on the United States. 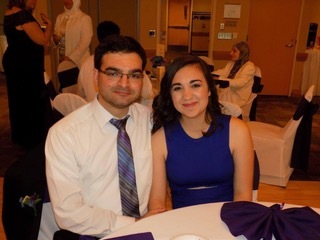 Panos had been through the immigration process as a student and already knew they were going to need help applying for his marriage-based green card. With other visa applications, Panos would gather all the forms and instructions from the U.S. Citizenship and Immigration Services (USCIS) website and fill everything out on his own. That’s exactly what he started doing with his marriage-based green card application. As Kaitlin put it, “What’s great about Boundless is that we had someone to reach out to. During the Social Security number process, we had nobody. But during [the green card] process, I was like, ‘Well, let’s email Boundless,’ and it just eased my anxiety. The major pro was just how simple it all seemed. There was going to be someone we could reach out to all the time. Once the couple started filling out the application through the Boundless system, Panos said he realized that he wouldn’t be emailing sensitive documents back and forth with an attorney, and that Boundless was actually the safer option. “I liked that when I was submitting all of our documents, there was a way to do it with your website instead of emailing them. That was the thing that gave me ease, the online portal,” he explained. When Boundless customers run into any problems, their independent immigration attorney (included with Boundless) is always just an email or phone call away. Kaitlin and Panos worked with Anjana Prasad, whose legal services were included in the one-time Boundless fee the couple paid. Anjana helped them complete their application, answered their questions, and reviewed their final paperwork to make sure they had the best chance of success. Boundless has a detailed guide to translating documents into English. Before sending their application package to USCIS, all the couple had to do was sign the clearly marked dotted lines. Having sent off a carefully organized, thorough application package, Kaitlin and Panos were summoned to their nearest USCIS field office for the green card interview, which many applicants dread. But Kaitlin and Panos need not have feared. In addition to studying the Boundless interview preparation materials, the couple did a lot of their own research. For a good part of the day after the interview, the couple wondered if they’d failed or passed. Most of their anxiety would have been alleviated had Kaitlin checked her phone sooner. As always, Boundless asked how likely the couple would be to recommend Boundless to others on a scale of 1–10. “Thank you guys so so much it seems like you guys have personal experience, which is why you started Boundless,” Kaitlin added.